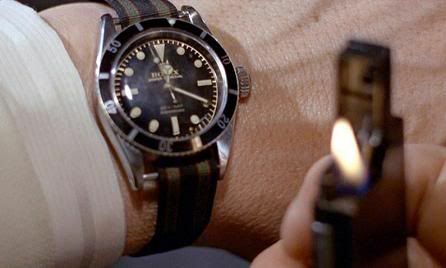 I don’t like NATO straps at all, and find them far from stylish, but I guess that there are a lot of Rolex (and Bond) fans that do. But look at the width of the strap, it is way too small, approximately 18mm (if not any smaller). This looks plain ugly, and I can’t imagine they couldn’t find a right NATO strap for this watch in 1964. Anyway, some of the Rolex / Bond fans are delighted by finally having such a nice close-up, so they can get a NATO strap with similar pattern. Visitor Dieter of the R-L-X forum, found one that comes close AND fits properly. I really wonder if the real fan will go for a 18mm version of this strap to attach between the 20mm lugs. In this case, I think that Dieter is more stylish than James Bond. 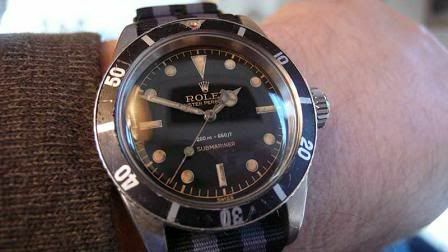 🙂 His vintage Rolex Submariner with the patina dial looks superb! As far as I can judge it, the original bezel is still there and looks niceley aged. However, I cannot getting used to these NATO straps. A sporty Rolex should be on a stainless steel bracelet, any time. Also for Mr. Bond.